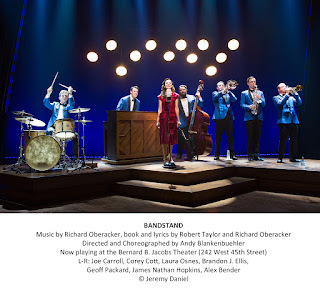 The generic title doesn’t really give you much of a clue what it’s about, but “Bandstand” turns out to be an absorbing musical drama about a World War II veteran (Corey Cott) who, after finding doors to employment shut after the war, decides to form a band of fellow battle-scarred vets, with the widow (Laura Osnes) of his best buddy as their lead singer, to enter a competition that will bring them from hometown Cleveland to New York for a national radio broadcast. The plot may have a TCM deja vu ring, but the dialogue is solid and believable, the characters real, and the staging by “Hamilton” choreographer Andy Blankenbuehler impressively fluid, the exciting dancing neatly mirroring every plot turn, making for an engrossing evening. Laura Osnes is as ever a joy, sings beautifully, dances gracefully, and gives a thoroughly well thought-out performance. And Cott -- rather miscast in the Louis Jourdan part in last season’s misguided revival of “Gigi” -- is outstanding here. You really feel his pain. He deserved a lot more recognition from the Tonys and other theater awards competitions. But, in my book, he gives one of the best leading actor performances in a musical this season. 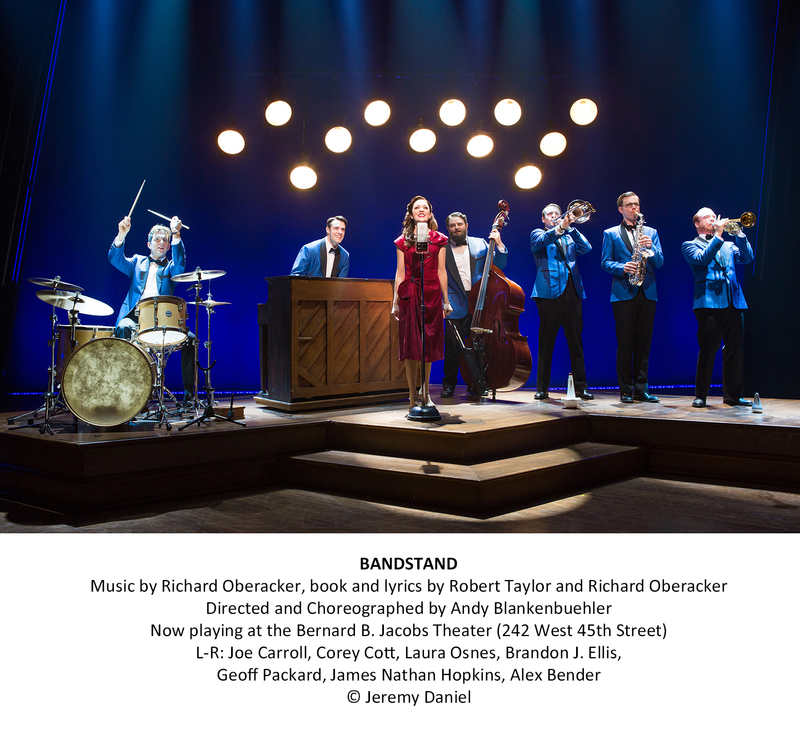 The sincerity of their performances, and those of their fellow band members -- Alex Bender, Joe Carroll, Brandon J. Ellis, James Nathan Hopkins, and Geoff Packard -- who play their own instruments make for appealing and refreshingly adult entertainment. And Beth Leavel is another big plus as Julia’s sympathetic mother. There are some nice things in Richard Oberacker’s score which avoids the pastiche style of, say, the Sherman Brothers’ tuneful score for the Andrews Sisters musical “Over Here” in 1974. Cott’s opening song “Donny Novitski,” Osnes’ “Love Will Come and Find Me Again,” the second act opener “Nobody,” and “Welcome Home” struck me as standouts. Much of the rest is less distinctive, but I always say it’s difficult to do justice to a score when hearing it for the first time. 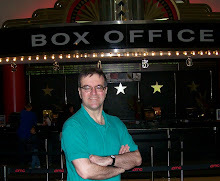 Bill Elliott and Music Supervisor and Arranger Greg Anthony Rassen share credit for the lively orchestrations. Oberacker shares book and lyric honors with Rob Taylor. As noted, the script is particularly strong and uncommonly intelligent. David Korins’ set -- lighted by Jeff Croiter -- allows for the multiple scene changes, including, ultimately, New York, the splashiest set. Paloma Young’s costumes are period perfect. Nevin Steinberg’s sound design begins at way too high a decibel, but gradually settles down to something more suitable for the 1940s period. The production premiered in October 2015 at the Paper Mill Playhouse in New Jersey. I didn’t see it there, so can’t tell how much refining may have taken place in the interim, but what’s onstage now at the Jacobs is impressive. My audience watched it with rapt attention, as they would a compelling drama which indeed it is.